Popping the Cork: What Caused the Rise of the Colorado Plateau? A couple of weeks ago I discussed geology, the Colorado Plateau, and the mysteries of the plateau's uplift, and promised a possible explanation. Aside from finding this stuff interesting in its own right, I'm hoping that great knowledge of these geological processes and the various ways in which visible landforms are created will enable me to create more credible and realistic geology for any fictional settings I come up with. For example, in one story I want to have a copper mine in a mountain setting. Is that even possible? How are copper deposits created and how do they end up where they are? I don't have the answer to that yet, but just popping it into a picturesque location without giving these questions due consideration is not something I want to do. Over the past couple of decades, it has become quite fashionable in the geological community to relate all structural episodes such as described for the Colorado Plateau to "plate tectonics"...the concept of plate tectonics may be likened to a new religion. Since hard facts are lacking, if one is not a "believer" one is considered an "atheist" with regard to the many theories and interpretations of the "clergy": the oceanographers and geophysicists. Note that while my edition of Baars is from 2000, it is a revision of an earlier work. Baars points out a variety of problems with the application of plate tectonics to Colorado Plateau geology, and his point is well taken: there are many geological processes that are only remotely related to plate tectonics. My excerpt skips over much of his reasoning. At least he discusses it, though the scare quotes hint at some traumatic conference encounters with arrogant young pups pumped with the gospel of plate tectonics. In his otherwise admirably thorough Geological Evolution of the Colorado Plateau of Eastern Utah and Western Colorado (2011), Robert Fillmore barely mentions it. A currently popular theory that explains not only the Colorado Plateau, but the Front Range of the Rockies and the Basin and Range province involves the subduction and disappearance of the Farallon Plate under the North American Plate. Actually, as you might expect, the Colorado Plateau is very much an afterthought in this theory, and is more ambiguously a consequence of it than some other things. Note: the diagrams are from the fine book, Rough-Hewn Land, a Geologic Journey from California to the Rocky Mountains, by Keith Meldahl, which I will go into in more detail in a later post. Very briefly, the Farallon Plate, an oceanic plate, was west of the North American Plate, a continental plate. 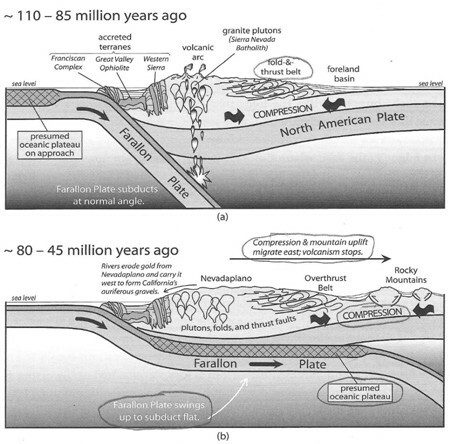 They moved toward each other, making a convergent plate boundary. As happens in these cases, between 110 and 85 million years ago, the lighter continental plate rode up over the heavier oceanic plate, and the Farallon Plate dove under the North American Plate, in a process called subduction. That generated magma, which rose up and resulted in what is now the Sierra Nevada range. This is fairly common. The Andes and other mountain ranges are caused by the same process. But then the Farallon Plate did something less common. Instead of continuing to subduct steeply, about 80 to 45 million years ago it flattened out, and slid under the North American Plate without continuing to dive and melt. There are various explanations for why this happened which I won't go into here. Since it didn't melt, it went much farther than it usually would have, eventually shoving up the Rocky Mountains, way farther from the continental plate boundary than mountains usually form. This is called the Laramide Orogeny, which for a long time was just a mysterious and evocative term in the books I read to try to understand things. I really didn't. At this same time, the cork of the Colorado Plateau was also forced up, but did not get as deformed as the rocks in the new mountains. 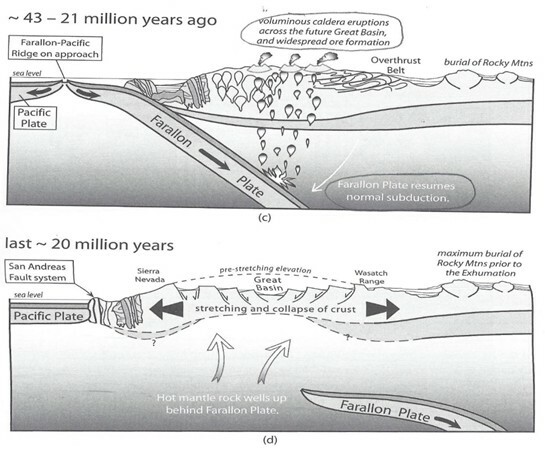 Then, 43 to 21 million years ago, the Farallon Plate resumed a normal pattern of steep subduction. Gigantic volcanoes erupted all over what would become the future Great Basin, west of the Colorado Plateau. A lot of the mineral wealth of the area comes from this time. In the last 20 million years the North American Plate rode right up over the Farallon-Pacific Ridge, which is where the seafloor spreading that fed the Farallon Plate occurred. Cut off from a source of new crust, the Farallon Plate stopped growing, sank, and vanished. The result was a upwelling of hot mantle rock that stretched the crust and created the Basin and Range and its north-south ranges of mountains: the landscape of much of the desert West. As I mentioned earlier, the rift valley of the Rio Grande is also part of this same stretching. You will notice that the Colorado Plateau is again an afterthought. The real action is in the east, where the Rockies form, and to the west, where the Great Basin emerges. The Colorado Plateau is the Haydn of geology, too calm and well-mannered to get the same attention as Beethoven and Mozart. It just keeps on composing geological symphonies. 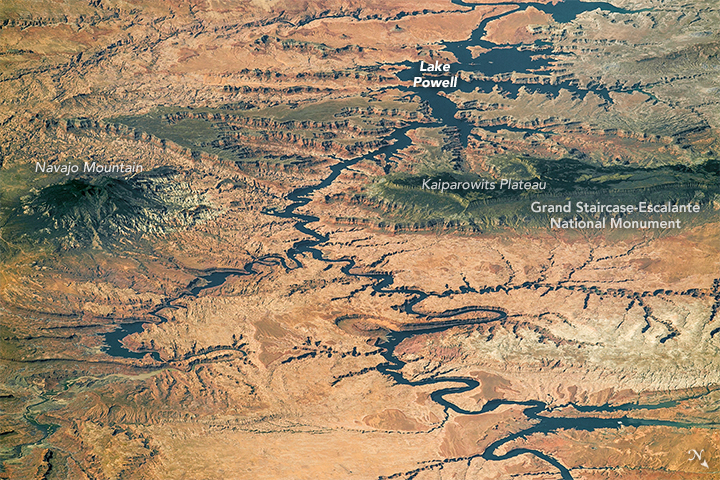 Now, the detailed geology of the Colorado Plateau has a lot of specific interest, and I've used it in my own work. But this is enough for today. Is this at all how you understand things? Figuring this out has really enabled me to get the Colorado Plateau in a way I didn't before. Do you need this kind of fundamental explanation to appreciate things, or can you live with more specific knowledge?